We quite often blitz surplus root veg and cooked greens together. Brussels sprouts blitzed with creamed celeriac and some stock was a particularly successful improvisation. A handful of crisp, salty bacon bits is a great finishing touch. Heat the butter and 1 tablespoon oil in a large saucepan over a medium heat. Add the onion and sweat gently for a few minutes. Add the celeriac, stir to combine, then cover and sweat for about 10 minutes to soften. Add the stock, bring to the boil, then reduce the heat and simmer for 15–20 minutes until the celeriac is tender. Add the sprouts, return to a simmer and cook for 5 minutes more. Purée the whole lot in a blender until smooth. Return to the pan. While the soup is cooking, heat a trickle more oil in a frying pan over a medium heat and fry the bacon until crisp and golden brown. Drain on kitchen paper. Add the cream or milk to the soup and reheat gently. Season with salt and pepper and serve, scattered with the bacon. 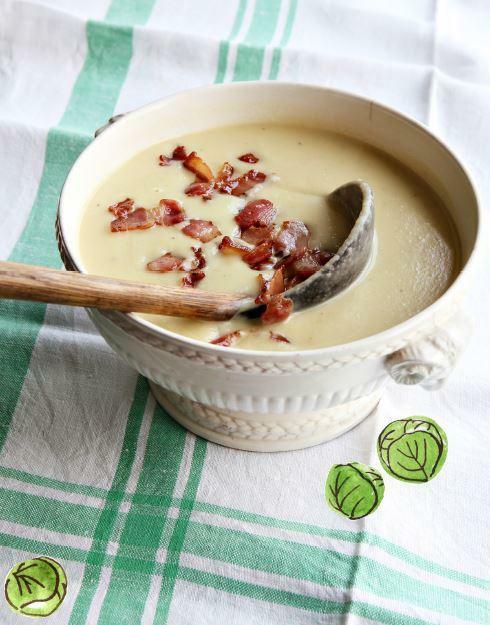 For a vegetarian version, just serve the soup without the bacon. Some toasted blanched almonds or crispy, garlicky bread croûtons are great alternatives to the bacon to give the soup a bit of a fancy finish.